The Medical Doctor as a role is a vital one. If you know what you're doing - and you will eventually - you will save lives. Nearly every death can be prevented, provided you reach the victim in time. Since Medical Doctors are the only ones with the tools and the in character experience to save them, Medical Doctors tend to make a lot of friends. You should know what most chemical medicines are (although you are not required to know how to make them), so look that up on the Guide to Chemistry. It never hurts to know what the other medical stuff does, but if you have a Chemist that can make them, they can also tell you how to administer them. There is no disadvantage to pursuing knowledge regarding medical. Learn, and keep learning. Normally you start with a sterile jumpsuit and labcoat holding an advanced kit. Medbay is located on the top floor (Asteroid 3) west of the elevator, which is where you will want to go. If you're in a reception area with white floors and blue accents, you're in the right place (just don't get confused with Surface Triage on Surface 3). As a Medical Doctor, your job is to heal people, save them from the brink of death, and resleeve those that are dead. You can diagnose injuries with the help of a health analyzer, which you helpfully spawn with. Your PDA can work as an alternative, thought he standalone is far superior. From a roleplay standpoint, you and the rest of medical are meant to be the only ones who can understand the readout. In terms of your equipment, the general rule is that chemical treatment works at all health levels, whereas physical treatments have limits where they become ineffective. Rolls of gauze and ointment are for minor injuries and don't yield much in the way of treatment other than first aid. Advanced trauma and burn kits are more effective and should be used anyway, as there is an abundance. Beyond that, more advanced treatment is needed. Medbay has a few different yet important facilities such as the Emergency Treatment Center (ETC), Sub-Acute/Recovery Ward, Exam Room, Patient A, B, and C rooms, Operating Theatres, Chemistry, Psych Room, Primary Storage, and Resleeving Lab. In Primary Storage and near the Patient rooms are stairs leading to lower medbay, which includes Secondary Storage, the Morgue, Break Room, EMT Bay, and Virology. This is the Emergency Treatment Center, the highlight and possibly the most important area of Medbay. It features two sleepers for quick treatments and a body scanner for in-depth diagnostics and analysis that a health analyzer wouldn't be able to yield, as well as two cryo cells for all-around treatment. There is also a defib charged and ready, two rechargers for the defib batteries, extra roller beds, an IV drip for patients who need blood in an emergency with blood bags in a locker, and a sink. A large room with six beds and a NanoMed. Patients that are recovering from treatment - such as surgery - are placed here until they are fit for work again. It also features window tinting and a door button so that patients may leave whenever they wish. Basically an over-glorified patient room. Includes a few items to diagnose trivial ailments and a bed. Also has window tinting and a door button so that patients may leave whenever they wish. Mostly used to lewd people than actually perform examinations you filthy animals. Small rooms with no access requirements on the doors. Good for isolating patients when the Sub-Acute isn't private enough for their liking. Features window tinting. These rooms are dedicated to performing osteopathy, and include the tools needed to carry out such. These rooms are better known as OR1 and OR2 respectively. OR1 has two sets of surgical instruments, allowing two surgeons to operate on one patient at the same time. OR2 is smaller and features only one set of tools, but is used more often. Both rooms have an anesthetics closet, IV drip, blood bags, patient monitoring consoles, and window tinting. If you've heard of cloning, resleeving is just about the same but with a few more steps involved. 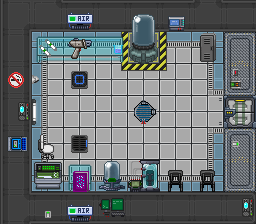 This room contains a resleeving console to control the following equipment: a growing vat to grow a body from a body record, a cryogenics tube to mend any physical defects of the sleeve, and a resleeving unit to sleeve the patient's latest mind record into the body. The room also contains a locker with spare clothing and radios, window tinting, and a door button so that patients may leave. 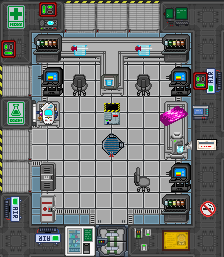 A small room pretty much in the middle of medbay with a NanoMed, SmartFridge connected to Chemistry, NIFSoft disks, two doctor equipment lockers, and a few stasis bags among other equipment. Has stairs leading down to Secondary Storage. A lab that a Chemist normally works in connected to Primary Storage with three dispensers, three ChemMasters, three large beakers, a grinder with a few sheets of phoron, a couple of lockers with chemistry equipment and attire, and a SmartFridge for storing medicine synthesized by the Chemist. Features a button to close the window shutters in case of potential break-ins. A somewhat large, comfy room for the Psychologist to use to assist patients with their mental fears and troubles. Features a chemical closet, bookshelves and therapy dolls, couch and chair, and window tinting. If the windows are tinted, then it's probably best to not go inside. Down here is where a bit more equipment is stored, such as a handful of medical kits, a defib, three roller beds, medical belts, stethoscopes, two doctor equipment lockers, and - probably the most important of all - the cryogenics freezer controlling the cryo tubes above. A dark and dusty room with eleven morgue trays, body bags, and an autopsy table with scanner. This compact room features the bare necessities that Paramedics will equip to take on the challenges of retrieving patients during an emergency. 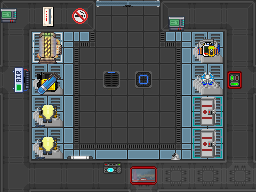 This equipment includes two EMT lockers, two (disassembled) EMT voidsuits with a suit cycler, a Rescue RIG, and a compact defib. The room is accessed through two windoors, which can both be clicked so that they remain open for faster access. A large but seldom used facility for virologists. 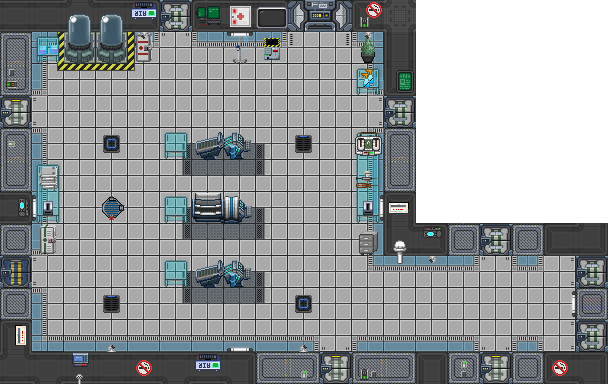 Features two basic quarantine airlocks, two isolated patient rooms, a large quarantine room, an isolator, a disease analyzer, two incubators, two centrifuges, and a food dispenser for viruses. Perhaps the most common and prevalent form of damage, brute is the red number on the health analyzer. Anything that results in physical trauma such as punching, cutting, stabbing, low pressure, or anything else that causes bruising or cuts is summed up by brute damage. Bruising, under most circumstances, won't cause bleeding, and small amounts of bruising can be easily treated with an advanced trauma kit. Cuts, on the other hand, may cause bleeding and must be treated immediately with either gauze or kits. Using trauma kits will instantly heal three brute damage and will trigger the patient's mob to slowly heal on it's own. Higher levels of brute (such as 50 and above) may require Bicaridine for more effective and swift treatment. All crew have blood, and said blood carries oxygen throughout their body to keep it alive. Loss of blood means less oxygenation, and puts the patient's life at risk if not remedied quickly. Blood loss can be caused by cuts, intense burns, loss of limbs, damaged lungs, destroyed liver, or internal bleeding. Common symptoms of low blood levels are dizziness, fainting, pale skin, blood dripping from the patient and onto the floor, oxygen damage, and - perhaps the worst of all - brain damage. Critical levels of blood loss will eventually build up enormous amounts of toxins and will swiftly kill the patient. Treating bleeding should be your first priority, which can usually be accomplished by applying gauze or trauma kits to the area in question. Internal bleeding, however, is different, and will require the body scanner to locate where it is occurring and surgery to remedy it. Alternatively, Myelamine (better known as Quick Clot) can be used to cure internal bleeding. Burn damage is the yellow number on the health analyzer. Usually caused by intense heat/cold (such as being in super heated atmosphere/fire or space) or electrocution. Burns may cause intense pain and can put someone into paincrit rather quickly, being electrocuted at high wattage may dismember limbs, and intense burn sources can boil out their blood. Burns also present a high risk for infection, which if left untreated may become lethal. Treatment for small burns can be accomplished by using ointment/burn kits (to clean potential infections) alongside gauze/trauma kits (to encourage healing). Higher levels of burn will require Kelotane or - if a Chemist is present - KeloDerm/Dermaline, which both work much more efficiently than the basic medicine. Toxin damage is the green number on the analyzer. Poisons, overdosing, phoron exposure, radiation, critical blood levels, a damaged liver, infections, and handling contaminated items all result in toxin damage. Toxin damage may be hard to identify outside of using a health analyzer, though common symptoms are aching, stinging, vomiting, and damage to the liver, though other organs may be damaged depending on the poison in the patient's blood. Treatment should always start with removing the patient from the source of the toxins. Poisons/Overdosing: Activate dialysis in a sleeper. Phoron Exposure: Request the patient to remove all clothing articles and place any contaminated clothing in a washing machine. Radiation: Administer Hyronalin/Arithrazine and place them in a cryo tube if they have clone damage. Infection: Administer Spaceacillin and monitor the stage of infection. Gangrene/Necrosis: Amputate/extract the limb/organ in question. If the organ is vital to the patient's health, keep patient stable until robotics can fabricate a replacement organ. Damaged Liver: Administer Dylovene/Carthatoline if the damage is below 15. If the damage is above 15, administer Peridaxon or conduct surgery to heal the organ. Critical Blood Levels: Hook patient up to IV drip with O- attached immediately. Once all of the sources of toxins are gone, administer Dylovene in appropriate quantities. Dylovene does not overdose (it does, actually, but the resulting toxins are cured by the Dylovene itself). Suffocation damage (aka Hypoxia) is the cyan number on the analyzer. Lack of breathable air, damaged lungs/heart, blood loss, and suffering from critical health may all contribute to the lack of oxygenation. Symptoms are gasping and loss of consciousness. Treatment can be done by performing CPR on the patient, supplying internals with doubled pressure output, or by administering Inaprovaline, Dexalin, or Dexalin Plus. Organ Damage: Just plain damage that could easily threaten the life of the patient. Peridaxon is the go-to medicine to treat such damage, though some medicines like Imidazoline and Alkysine treat some specific organs faster. Otherwise, use surgery to cure the damage directly. Brain Damage: This works the same as the above, but is much more important as too much damage to the brain will kill you instantly with no chance of resuscitation, requiring resleeving all together. Clone Damage: Damage on the genetic level that can affect someone's overall health. Coming out of a stock growing tube will leave you with clone damage, as well as suffering from the effects of high doses of radiation. Treatment is as simple as placing the patient in a cryo tube of cryoxadone/clonexadone, or by administering Rezadone. Not to be confused with mutations. There are three type of medical states. The first is 'shock', which is the least dangerous of the three. If someone takes enough damage from any damage type, they may go into shock. This causes stammering and slow movement, and eventually collapsing and loss of consciousness. This can be dealt with by simply treating the most prevalent damage, or temporarily by administering a painkiller. The second is known as 'soft critical'. When someone is below 0% health (having taken more than 100 points of damage), they will suffer shock until they are above 0% health. The third is known as 'critical' and occurs at -50% health (more than 150 points of damage). At this point, the patient will go unconscious, stop breathing, and take suffocation damage as a result. This can be stopped with Inaprovaline or CPR. Immediate treatment is advised, though a cryo tube may assist in keeping them stable. Surgery mostly encompasses mending broken bones and dealing with internal bleeding or incredibly high amounts of organ damage. Generally you should leave this to Surgeons unless there are none. Medicine treats injuries, but too much medicine can cause the injury. Most medicines will overdose at 30 units, though a few (such as Dermaline and Dexalin Plus) will overdose with only a full syringe (15u). Overdosing will begin building large amounts of toxin damage in the patient and, should it happen, will have to undergo immediate dialysis treatment. A good rule of thumb is that if you're injecting more than one whole syringe of one particular medicine, then the patient is probably already dead with that amount of damage. Medical staff are expected to be professional about their treatments and confidentiality. Assistant Bubber Jones really wants to know about Cindy Kate's obstetric history? Deny them, they don't have the right to access that information outside of the patient's consent. Engineer doesn't want to get treated for their dangerously high amounts of Radiation? You'll have to let it go, he's denying treatment. The oath that all medbay staff take, including you. To sum it up: Do your job and give it your best, you're to be professional, you're to be honest, you shall do no harm in the field of treatment, you will not be biased, you will not refuse a patient treatment, you will refuse treatments and policies that go against the intent of the oath, you will assist the patient in making informed choices regarding their treatment, and you will learn and keep learning. Everyone has problems, and many problems and treatments don't need to be made public to others, not even the Colony Director or Central Command if they order you to. Everything about a patient is to remain confidential, only to be shared with the patient and the medbay staff involved. The only way this can be overturned is if all patients involved consent to divulging their medical information, or if the Chief Medical Officer orders it. Patients are granted the ability to refuse medical treatment as long as they are fully capable of understanding and consenting to the refusal. People under the influence of drugs and/or alcohol are unable to deny treatment. Essentially a patient can tell you to stop treating them at any time as long as they are fully aware of what they're ordering. This may in fact spur drama and blame from friends of the most-likely deceased crew member, but it is not your fault. Ignoring this right would be to ignore SOP and could very well result in the termination of your employment. Cryogenic tubes will heal pretty much every surface damage as long as they're cold enough and if they have a cryo mix in them (Cryoxadone/Clonexadone). To setup, walk down to Secondary Storage and locate the freezer on the west wall. Set the temperature anywhere between 20K and 80K. Setting it too low will just keep the freezer running the whole round and draining a ton of power. Setting it too high may result in the patient's body not cooling in time for the cryo mix to work. Once that's set, head back up and place the beakers of Cryoxadone in the tubes unless there's a chemist, in which case you may want to leave it to them to decide a mix for the tubes. Interesting tech from KHI presents a new take on cloning: Resleeving, a method that involves keeping the body record and mind record separate, potentially allowing patients to transfer to a new body of their choice on a whim. Resleeving is paired with backup implants which periodically backup someone's mind state to a server versus someone's one time scan with conventional cloning technology. On top of this, once a backup implant is unable to backup a patient's mind state, the server will broadcast over the medical frequency that the backup has failed and that the patient is most likely dead. Listen for the death alarm over the radio, or when someone requests that they be resleeved. Ensure the patient still has a mind record through the console. If not, there's nothing you can do unless the body is still intact. If the body is intact without a mindscan, use a SleeveMate on the body and scan their brain (not their whole mind). Begin growing the body. After some time, the body will be ejected from the tube with roughly only 20% health due to clone damage. Place the body in the cryogenics tube and turn it on. Retrieve a jumpsuit from the spare clothing locker. Eject the body once it has reached full health and place the jumpsuit on them. Place the body in the resleeving tube and sleeve their mind record into the body. Eject the body, buckle to a chair, and shake them awake. Tell them the truth unless their records say otherwise, avoid speculation, attend to any of their concerns. You're a doctor, you've spent many years getting to where you are now. You're more than likely a professional. Professional does not mean arrogant or pretentious. Doing the bare minimum to treat a patient just to shove them out the door so they can get back to work is a waste of roleplay opportunity. Speak with the patient, keep them informed. You'll probably notice pretty much no one bothered to write their own medical records. Offer to update it for them in the exam room! A template can be found here. Medical staff are held to very strict policies and procedures, do not neglect reading about them. There is a nice array of alternate job titles for this role, allowing better specialization. Nurses take care of reception and assist doctors. Surgeons do surgery. Emergency Physicians handle critical injuries. Virologists do nothing because there's no frikkin virus samples in virology. Remember that you are not allowed to abandon medbay to scene during an emergency. This page was last edited on 26 January 2018, at 01:10.